Ain't Goin' Down | recorded for the Use Your Illusion albums. 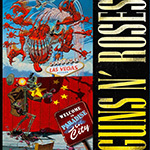 Used in the GN'R pinball machine. 2004 Hollywood Rose - Roots Of Guns N' Roses Axl and Izzy before GN'R.